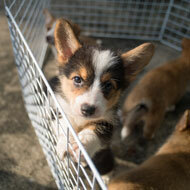 DEFRA expressed their support for tackling puppy smuggling. Tougher animal cruelty sentences, rescue centre regulations and the international movement of puppies was debated in Westminster Hall on 4 December 2018. Led by Jim Fitzpatrick MP, a committed animal welfare advocate, many of the issues raised were welcomed by Battersea Dogs & Cats Home. Present at the debate was DEFRA minister David Rutley MP, who expressed his support for tackling illegal puppy smuggling and the exploitation of the current international Pet Travel Scheme. The Association of Dogs and Cats Homes (ADCH) composed a ‘Minimum Standards’ proposal in regard to the regulation of animal rescue centres. The proposal consists of a template for establishing best practice and protecting animal welfare. The Government's commitment to five-year sentences for animal cruelty was restated by the minister, however Battersea were disappointed that a date for a new Bill is yet to be arranged.